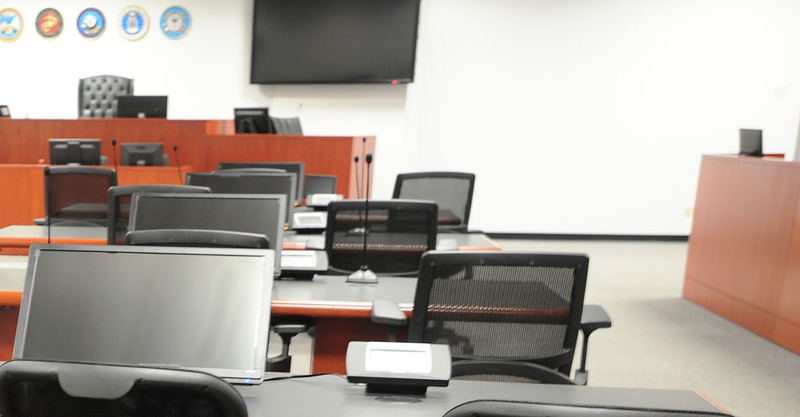 Photo of the courtroom used for the Sept. 11 case provided by Joint Task Force Guantanamo Public Affairs. A military judge’s decision to block the government from using statements that the five Sept. 11 defendants made to FBI interrogators at Guantanamo Bay was, in the words of defense attorney James Connell, “the most important ruling in the whole case so far” – a notable assessment given that more than six years of pretrial litigation have followed the May 2012 arraignment. The decision on the statements followed months of discovery battles over the years of abuse suffered by defendants at CIA black sites before their arrival at Guantanamo Bay in September 2006. Defense lawyers claimed the severity of past torture also tainted the so-called “clean team” FBI interrogations and wanted to independently investigate the details by speaking with CIA personnel involved in the program. But the government issued a prohibition against doing so, claiming that defense attorney inquiries could compromise national security and the safety of covert CIA agents. As the dispute reached a boiling point this summer, prosecutors asked Pohl to issue a protective order signing off on the prohibitions while the defense teams argued for dismissal of the case for what they said was an unconstitutional government interference into a critical part of their legal responsibilities. Prosecutors wanted interview requests for CIA personnel involved in the program to be routed through the government in a protocol designed to protect identities, a system the defense claimed was unfair and unworkable. Pohl hinted to all parties in the July session that the issue had to be decided before the next pretrial round scheduled for Sept. 10-14. He said Friday that the government could keep its investigative prohibitions to protect the identities of CIA personnel involved in the interrogation program – but not without a serious cost. “I think this is his way of delivering a message to the government that maybe he can’t do anything when it comes to classification or the government’s national security privilege, but he can take steps to impact their litigation of the case,” Walter Ruiz, the lead defense attorney for one of the defendants, Mustafa al Hawsawi, said. Ruiz said Pohl’s ruling will not be “the last word on the matter.” The prosecution has signaled to the defense teams that it will ask Pohl to reconsider his ruling. Ruiz said the prosecution team could go back to the classification authority, in this instance the CIA, and see if the restrictions on the defense teams can be loosened or reworked in some way. Pohl’s decision, first reported by the New York Times, effectively preempts suppression motions for the FBI statements that the defense teams had long planned but not yet filed; they hoped to better arm their motions with details of the CIA program and proof of any coordination between the agency and the FBI. The judge found the government’s protocols and the discovery provided on the CIA program did not provide the defense teams with “substantially the same ability” to litigate the suppression of the FBI statements as if they had “access to the specific classified information” – the standard used in the military commissions and federal court for accepting substitute evidence. But Pohl went on to say that if there are convictions, the defense teams are not as negatively affected by the restrictions when it comes to their efforts to mitigate against the death penalty. This part of the decision favors the government, though prosecutors still cannot use the FBI statements. Pohl said that discovery the defense has received on the CIA program, as well as their ability to seek interviews from CIA personnel through the government, leaves the defense in “substantially” the same position to litigate mitigation. “The judge is clearly correct that the discovery provided is insufficient to put us in the same position to move to suppress the FBI statements,” David Nevin, the lead attorney for Khalid Shaikh Mohammad, said. But he believes Pohl was wrong to conclude that the defense teams are in substantially the same position to litigate mitigation. In court, Nevin has been adamant that the panel of military officers who will serve as the jury in the case will need a complete picture of the torture to decide whether the government has the moral authority to execute the defendants. Pohl’s split decision only hints at an “internal logic” that is not fully fleshed out in the 36-page ruling, Connell, the lead attorney for Ammar al Baluchi, said. It also leaves a big question mark on motions that the defense teams plan to file seeking dismissal of the case for outrageous government conduct – specifically, whether Pohl believes the defense teams have “substantially the same ability” to make these arguments in light of the existing discovery and investigative prohibitions. In these motions, which teams have been discussing or drafting, lawyers hope to flesh out what they view as an international criminal conspiracy run at the highest levels of the U.S. government. Some teams may nevertheless choose to file suppression motions for statements their clients made after arriving at Guantanamo Bay during their Combatant Status Review Tribunals, or CSRTs, an administrative procedure in which the government reviewed whether the detainees were properly held as enemy combatants. Not all made incriminating statements, but Mohammad, for example, took responsibility for planning the Sept. 11 attacks in his hearing. Nevin said his team would file a motion to suppress statements from the CSRT if the government planned on using them, based on the same taint logic applied to the FBI statements. Ruiz said he will do the same for his client. He said that if Pohl believes the defense teams are not fairly positioned to litigate the suppression of FBI statements based on investigative restrictions, the same reasoning should apply to their ability to seek suppression of incriminating CSRT statements. In fact, Ruiz is in a trickier position given that two FBI “clean team” agents already testified against his client in a personal jurisdiction hearing last year, in which the prosecution had to present some evidence to establish that the commission had jurisdiction over al Hawsawi. All defendants can seek such a hearing; al Hawaswi’s was the first to move forward, and it did so with testimony by the agents who conducted the January 2007 interrogations. Pohl sided with the government on the jurisdiction issue. Ruiz said his team would “retrace” that litigation to determine if they should seek some type of reconsideration given that the judge has now blocked the usage of all FBI clean team statements. About the author: John Ryan (john@lawdragon.com) is a co-founder and the Editor-in-Chief of Lawdragon Inc., where he oversees all web and magazine content and provides regular coverage of the military commissions at Guantanamo Bay. When he’s not at GTMO, John is based in Brooklyn. He has covered complex legal issues for 20 years and has won multiple awards for his journalism. View our staff page.